Potassium-ion batteries (PIBs) have been considered as promising alternatives to lithium-ion batteries due to the rich natural abundance of potassium (K) and similar redox potential with Li+/Li. However, due to the large K ion radius and slow reaction dynamics, the previously reported PIB anode materials (carbon-based materials, alloy-based anodes such as tin and antimony, metal oxides, etc.) suffer from a low capacity and fast capacity decay. In order to achieve a high capacity and excellent cycle stability for K storage process, rational design of the electrode materials and proper selection of the electrolytes should be considered simultaneously. Recently, two research teams led by Prof. Chunsheng Wang and Prof. Michael R. Zachariah from the University of Maryland, College Park, have designed and fabricated a novel antimony (Sb) carbon composite PIB anode via a facile and scalable electrospray-assisted strategy and found that this anode delivered super high specific capacities as well as cycling stability in a highly concentrated electrolyte (4M KTFSI/EC+DEC). This work has been published in Energy and Environmental Science (“Super Stable Antimony-carbon composite anodes for potassium-ion batteries”). We have successfully fabricated a novel antimony carbon composite with small Sb nanoparticles uniformly confined in the carbon sphere network (Sb@CSN) via a facile and scalable electrospray-assisted strategy. Such a unique nanostructure can effectively mitigate the deleteriously mechanical damage from large volume changes and provide a highly conductive framework for fast electron transport during alloy/de-alloy cycling process. Alongside the novel structural design of the anode material, formation of a robust solid-electrolyte-interphase (SEI) on the anode is crucially important to achieve its long-term cycling stability. The formation of a robust SEI on the anode material is determined by both the surface chemistries of active electrode materials as well as electrolyte compositions such as salt anion types and concentrations. Therefore, designing a proper electrolyte is extremely important for the anode to achieve a high cycling stability. In our study, we have for the first time developed a stable and safe electrolyte of highly concentrated 4M KTFSI/EC+DEC for PIBs to promote the formation of a stable and robust KF-rich SEI layer on an Sb@CSN anode, which guarantees stable electrochemical alloy/de-alloy reaction dynamics during long-time cycling process. In the optimized 4M KTFSI/EC+DEC electrolyte, the Sb@CSN composite delivers excellent reversible capacity of 551 mAh/g at 100 mA/g over 100 cycles with a capacity decay of 0.06% per cycle from the 10st to 100th cycling and 504 mAh/g even at 200 mA/g after 220 cycling. 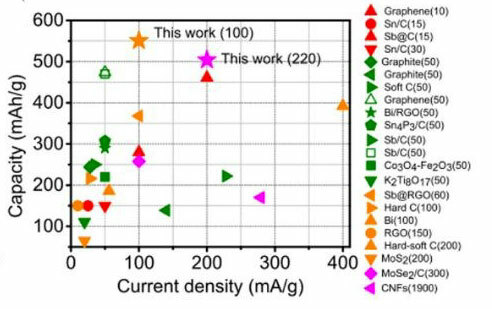 This demonstrates the best electrochemical performances with the highest capacity and longest cycle life when compared with all K-ion batteries anodes reported to date. The electrochemical reaction mechanism was further revealed by density functional theory (DTF) calculation to support such excellent Potassium-storage properties. In conclusion, these outstanding performances should be attributed to the novel nanostructure of Sb nanoparticles uniformly encapsulated into conductive carbon network and the formation of a more stable and robust KF-rich SEI layer on Sb@CSN in the optimized 4M KTFSI electrolyte. These encouraging results will significantly promote the deep understanding of the fundamental electrochemistry in Potassium-ion batteries as well as rational development of efficient electrolyte systems for next generation high-performance Potassium-ion batteries.